I’m starting to see dying less as an act of letting go and more as an act of will. It’s a grappling with the body. I dreamt that my mom drove me off a cliff. At first I was driving, taking my kids to family camp in Yosemite. I was gazing out over the wide valley, remarking to my sons about the bright spring flowers. As I looked, the blossoms seemed to zoom closer, so I could see the fine veins of their delicate green stems and yellow petals. Then my focus shifted back into the car, and I was a little girl, my mom now driving my brother and me to a mountain cabin we used to visit. Finally the dream telescoped back to the present day, my elderly mother now driving me. Just as I realized she shouldn’t be driving, she missed a curve and off we flew. Once my heart stopped racing, I considered the seeds of my dream. I was looking forward to our summer week in Yosemite; I just told a friend about my family’s winding drives to the mountains; I was fascinated by two climbers in Yosemite who accomplished the first free climb of El Capitan’s 3,000 foot Dawn Wall. And I think my mother is dying. I’ve never written that sentence before and I want to strike it out. I never say it out loud. She’s fading, I say to people; she’s diminished. Her world is shrinking. What I don’t say: She is weak and confused. She put her plate into the toaster instead of a piece of bread, washed her face with shaving foam. The last time she dressed herself, she tried to put gloves on her cold feet; since then, she’s barely changed out of nightclothes. So I dreamt that she drove me off a cliff and I have to face what I really think. I really think she is dying and I’m not sure how long this will take. I want to know. And I don’t want to know. 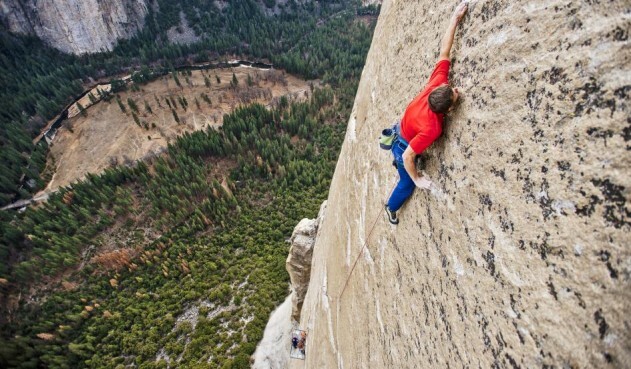 The Dawn Wall climbers, Tommy Caldwell and Kevin Jorgeson, figured their climb would take two or three weeks. They planned and prepared, rappelling down from the top of El Capitan and climbing up to map their route, for seven years. They’d tried the ascent a couple times before but always had to stop because of bad weather or injuries. The same night I dreamt my mom drove me off a cliff, they were on their fourteenth day of climbing up one. Free climbers adhere to certain rules. A climb is divided into a series of sections called pitches. The climbers use ropes only to catch their fall, not to pull themselves up; if they fall (and they do), they go back to the beginning of that pitch and start over. Completing a pitch, or “sending” it (from “ascend”), means you have come to the end of the pitch and can stand, hands free, for a moment without leaning on the belay. Caldwell and Jorgeson mapped the 3,000-foot Dawn Wall—so-called because it glows with the rising sun—into 32 pitches, several of which are rated among the hardest in the world. They climbed mostly at night, wearing headlamps, so that their hands wouldn’t sweat in the heat and slip off the sheer rock; during the day, they rested in their portaledges, 4×6-ft. nylon lean-tos they hung from the side of the mountain. They scheduled rest days to let their fingertips—sliced by the matchstick-thin holds on the rock and repaired with super glue—heal. Friends in the valley below sent up fresh provisions: hardboiled eggs, bagels with smoked salmon, dark chocolate. They even had whiskey. I realize I’m a little bit jealous of these climbers. Their effort seemed so clearly defined and well supported. They had a route, a goal. I try to push such thoughts out of my mind and do things that I can count and finish. I go to the gym and swing a dark green kettlebell in a figure eight between my legs and up over my head. Fifteen reps. I squat low, holding a heavier, gray kettlebell, and when I think of my mother struggling to get out of her chair, I go a bit deeper before pushing myself back up. Fifteen reps, then back to the figure eights for another 15. Three sets, back and forth. Then pushups and mountain climbers (where I do not even move across the gym, let alone up a mountain), my hands flat on the nubby grey carpeting, its surface probably more textured than the Dawn Wall. Twenty reps now, four sets. All the while I think about my mother, think about being strong to steady her, about pushing my own advancing age away. Distracted, I lose track of my repetitions, but the trainers count for me. After an hour, I am done. The Dawn Wall climbers’ ascent coincided roughly with my mom’s descent, as my siblings and their families dispersed from their Christmas visit with us. For a week, Mom summoned the energy for daily trips to our house and extra church services. But then she caught a brief cold, put on her bathrobe and climbed into bed. The cold is now gone and so is her strength. She can’t shuffle from the bedroom to the bathroom without leaning on the walls, and sometimes, on the way back, she pauses, uncertain where to go. It’s a tiny apartment—just three rooms—but she loses her way. Caldwell and Jorgensen used chalk to mark their route, to help them see the paper-thin holds for their fingers and toes; I sat at my desk tracking their progress on Google maps. As their attempt moved into its third week and started getting more media coverage, people wondered, what’s the big deal? It’s not like El Capitan hasn’t been climbed before. Two men first made the ascent in 1958, and in 1970, its Dawn Wall was “aid-climbed” by men using nylon ladders attached to the rock face. Caldwell and Jorgensen didn’t eschew gear entirely: Ropes kept them from falling; food kept them from starving; sleeping bags in the portaledge kept them from freezing. But none of that helped them go up. To make the ascent considered the hardest in the world, to climb a rock face smoother than the back of my mom’s wooden rocking chair, they would reach and stretch and grip; they hung, balanced with fingertips and toes, and then they urged their bodies up, up, a brutal, beautiful ballet. Sometimes at the gym I do pull-ups. I start on a stool and hook my foot into a long rubber band to give me a boost, but still, it scares me a little bit; my heart races as I pull myself up. I’m only 8 feet off the floor, but the height feels vertiginous and I stare straight ahead, breathing slowly to calm the rising panic. If I fall, I’ll just drop to the stool, no harm done. My hands burn as they grip, then sweat and slip as I let myself slowly down, trying not to swing my legs, and I joke with the trainer about chalking my hands. Nothing makes me feel weaker or stronger than hanging from that bar. I’m starting to see dying less as an act of letting go and more as an act of will. It’s a grappling with the body. Mom can’t move quickly enough to the bathroom so she chooses to drink less. She goes from eating an English muffin for breakfast, to one-half, to one-quarter, and tucks her engagement ring away into her jewelry box when it starts to slip. When I check her in for an MRI, the receptionist notes her age: 79. “Next birthday’s a milestone, Mom!” I say lightly. “What kind of cake should I make you?” She doesn’t answer, and I wonder if she’s heard, or if she’s weighing different decisions than chocolate or vanilla. Midway through the climb, at Pitch 15, Jorgenson stalled. Caldwell had traversed the horizontal pass easily and continued ahead for a time, but then, seeing his partner struggle, he waited, not wanting to complete the climb without the man he’d trained with for so many years. Jorgenson tried, and fell, and went back to the start of the pitch and tried again, and fell, and rested, going over the steps of the pitch—each finger and toe-hold—in his mind, and then tried again. At the peak of his strength and fitness, it took him 11 attempts over seven days before he sent the pitch. At the peak of my strength, I’d be happy to hike the hard eight miles to the summit of El Capitan; as it is, I’m proud of the new muscles carving my soft mom arms. I offer an arm to Mom as she tries once, twice, three times to push herself up out of her rocker. She refuses my help, and I give a little cheer when she’s standing. She is not dying right now, and she is. I’m not her trainer, I’m not her climbing partner, I’m her daughter. Our Dawn Wall doesn’t shine in the morning sun, but we will work together, she and I, climbing this hard mountain. Caroline Grant co-directs the Sustainable Arts Foundation, supporting writers and artists with children, and has published two anthologies. She lives in California with her husband and sons.